"Of Profits, and an Ill Wind." “You say that now, but wait until there’s a thousand ships coming out of it, all filled with people wanting to kill you,” Quark smirked at the sharp-featured human at the Science station as her eyes widened. “It loses its luster pretty fast when that happens, believe me.” The Ferengi took a seat at the empty Engineering station and watched something else on the viewscreen – a Bajoran freighter as it entered the wormhole at impulse speed. “I know the drill, boss,” replied the helmsman. “Matching speed and heading in, following the mark in three…two…” The Coldstar shuddered momentarily as it entered the wormhole shortly after the freighter it followed. “Did we trip any sensors, Louann?” he called out as he made minor course corrections. 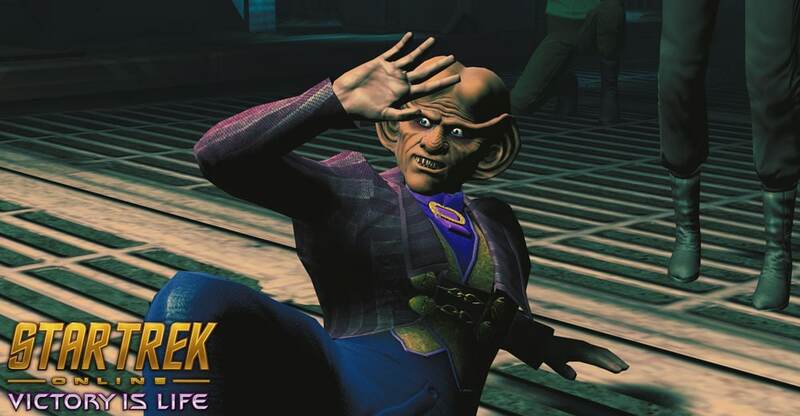 “Aren’t you a little overdressed,” said Quark, grinning at the boldness of the Ferengi woman. Quark gave Onna a smug look as he sat in the empty chair. “Captain’s chair, eh? Don’t mind if I do. Some of you need to remember who’s paying the bills on this trip, after all.” If he noticed the obscene gesture Onna made in his direction, he didn’t show it. “I thought that was the Tzenkethi,” Onna said, worry creeping into her voice. “What about ‘em,” Wilkins asked hesitantly, expecting bad news. “Thanks for coming along,” Quark said to the two men as they beamed in alongside him. “Something tells me this place might be livelier than usual now.” Varh nodded in acknowledgement; his massive Klingon security chief just curled his lip in a sneer. “The hazard pay you put up was a nice touch,” Varh said, looking around his surroundings. As an explosion echoed in the distance, he reached for his sidearm, a vintage Federation Type-2 phaser from the 2260’s. “Yeah, you’re right… I hear ‘em too.” Quark grimaced as he drew his own sidearm and moved to take cover behind Big Kor, who had a vicious looking automatic disruptor rifle almost as big as Quark at the ready. At least the walking mountain has a decent weapon, he thought to himself as the sounds of approaching life grew louder… and closer. “Take cover,” Varh hissed to his allies as he moved to crouch behind a nearby pile of rocks. He grinned as the giant Klingon moved next to him, followed by a very nervous looking Quark. “What, you two couldn’t find your own rocks?” Quark shook his head silently while Kor peered over the rocks, then returned to sign a message to Varh. An intense chittering filled the air as a single insectoid hexapod darted out of the canyon and into view. Several more followed it… followed by more… and more. Varh rolled his eyes before he took aim with his phaser. Big Kor smiled a smile that’d give another Klingon pause and sent a flurry of emerald devastation in the direction of the approaching swarm. As the mayhem grew in intensity, he heard a high-pitched wail. It was coming from Quark. “Thanks,” Varh replied with a shrug. “The big fella did all the work, though.” Big Kor signed a quick message to Varh, which the girl noticed. Big Kor issued an unnerving series of snorts that Varh knew was his version of laughter. Quark, on the other hand, sat next to the pile of rocks looking like he was about to be unwell. Again. Varh and Kor smirked and pointed at Quark simultaneously.